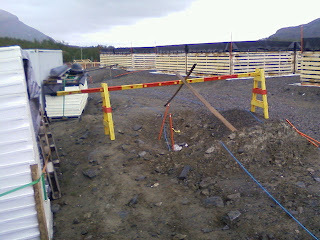 There are several long cable runs that need to be made during the installation of the LBA field. These require a moderately dry environment to prevent excess water ingress into the cables. Additionally, we need to protect the trenches somewhat, just to stop them becoming muddy and difficult to work in. 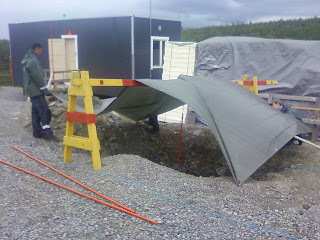 As a result, the team decided to build some temporary work shelters over the most vulnerable sections. These are the two mid-line draw trenches and the LBA-cable-mausoleum. The shelters are not particularly sophisticated. Simply some spare build timber and some canvas. However, the accomplish the task of providing some basic protection for the open draw pits. The frame was screwed together to hold it in place. In order to keep the canvas in place, additional support timbers were tied to the frame (square lashings, for any knot-enthusiasts out there!). Then the canvases were dragged over. 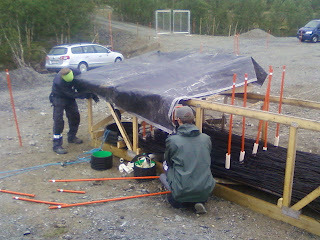 In order to secure the canvas to the ground, we used spare LBA anchor pegs. We have enough spare of these to get this done and the pegs have some very handy lugs that allow us to secure the corners of the canvas (with either bowlines or clove-hitches and 2 half-hitches, depending on the location). Not only did the draw pits get covered, but we also put some covering over the cable entry points in the LBA-cable-mausoleum. This was actually a lot easier, as the frame was already in place. 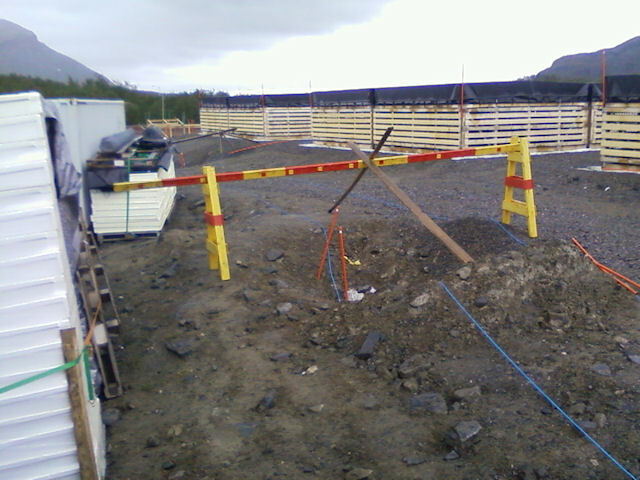 With all this done, we can proceed in pretty much all conditions with the cabling work.